Deposit #1 - 125% match with a max value of $125 and 60 Free Spins. Deposit #2 - 50% match with a max value of $125 and 20 Free Spins. Deposit #3 - 50% match with a max value of $125 and 20 Free Spins. The online casino has chosen a name that promises many things. ‘Fruits’ promises a collection of the best fruit pokies in the business. ‘Real’ promises real money gaming. ‘4’ promises that the four most important of online casino essentials are met. These are a continuous supply of casino games, fair and responsible gaming, weekly promotions and convenient banking transactions. Fruits4Real Casino is specifically targeted at Australian players. Though it offers the complete range of casino games, the focus is on pokies that are a favourite of Australian players. Most important is that it carries transactions directly in Australian dollars eliminating unnecessary currency conversion costs. The Fruits4Real Casino web site is user friendly and easy to navigate. The essence of online casinos is playing the games. These are displayed on the home page itself. All functions can be accessed from the home page in one click so Australian players do not have to frantically search for various activities. The online casino is licensed and regulated in Curacao, which is one of the oldest online gambling jurisdictions. So you can be sure that aspects concerning fair games and security of financial transactions are adequately covered. Signing up at Fruits4Real Casino is a simple process. You click on the Open Account button to initiate the process. Fill in the short registration form and submit it. You will receive a link in your inbox. Click on the link to activate your account. It should not take more than a few minutes. Before signing up it is advisable to thoroughly read and understand the Terms & Conditions. In case of any doubt you can contact customer support. Fruits4Real is powered by nine game suppliers. This is good for Australian players. There will be much greater variety and faster addition of new games as compared to online casinos with only one games supplier. At least three of these suppliers are recognised names in the online casino industry. Betsoft and Leander have been around for a decade or more. Betsoft video pokies are extremely popular in Australia because of their artwork that makes the symbols come alive on the reels. Pragmatic Play has also made a mark through several industry awards won in the last few years. The other software providers are Amatic, Endorphina, Gamomat, Imagina, Stakelogic and Wazdan. These games suppliers are bound to become big names in some time to come. Fruits4Real is giving Australian players first go with the pokies and other games of these software providers. Fruits4Real operates on instant play software for both desktops and mobile devices. There is no download required. The reliability of the software is of high quality. So the disadvantages of download software are eliminated without sacrificing the advantages. The software is compatible with all browsers and operating systems. All Australian players will have easy access to Fruits4Real Casino. Fruits4Real Casino offers over 500 games at the time of the review with numbers growing every week. With such a large portfolio zeroing in on preferred games can be a problem. But Fruits4Real has options to make this easier for Australian players. All the games are displayed on one page. There is a search engine available, which is very useful if you know the title. Then the games can be filtered by software providers and games categories and both. Fruits4Real does not list new games separately, but all new games are tagged for easy identification. Video Slots (Pokies): Fruits4Real Casino offers over 340 video pokies, which is the favourite game category for Australian players. With nine software providers contributing to this category, variety in gaming features is assured. Video pokies themes are also important for Australian players. There are plenty of titles that these players will be attracted to. Some of them are Darts Heroes, Football Mania, Hot Party, Miami Beach, Blue Dolphin and Great Reef. Fruit Slots (Pokies): The online casino refers to the classic pokies with retro fruit symbols as fruit slots. The name of the online casino derives from this category. There are over 100 titles, which is nowadays rare for classic pokies. Some of the fruit pokies that are recommended are Royal Seven, All Ways Fruits, Sticky Diamonds and Lucky Bells. Table games: Australians love to visit land casinos to play games like roulette and blackjack. Fruits4Real Casino enables them to play these games from home or on the move. All the standard versions of blackjack and roulette are on offer. Perhaps the most interesting category is of casino poker with titles like Oasis Poker and Triple Edge Poker. Jackpots: Fruits4Real offers a fair selection of pokies with jackpot prizes. These are discussed in detail in a separate section. Mobile gaming is on the rise in Australia and Fruits4Real is in the thick of it. The mobile gaming platform of the online casino is robust and flexible. It can be accessed from smartphones and tablets of any brand, whether operating on iOS or Android. It is compatible with all major browsers including Chrome, Safari and Firefox. The code is written in HTML5, which means the display automatically adjusts to screen size and orientation. The mobile and desktop platforms are seamlessly integrated. If you have signed up from the desktop platform, you can use the same user ID and password to log in and the same account balance to play games. If you are not a member of Fruits4Real you can sign up from your mobile device. Simply visit the casino’s web site on your mobile device and tap the Open Account button. Follow the instructions till you are registered. Then make a deposit from your smartphone or tablet and start playing. You can even withdraw winnings and participate in promotions on mobile devices. Big is a relative word. At Fruits4Real you will not find progressive jackpot pokies that pay out in millions when hit. Such progressive pokies have a flip side. They hit very infrequently. Fruits4Real has a selection of progressive pokies that walk the middle path with modest sized hits that occur more frequently. In main, three software providers contribute to the Jackpots section. Betsoft offers the more traditional progressive jackpots. Greedy Goblins hits by aligning five goblin symbols with maximum bet. In Mr. Vegas players have to trigger the bonus round, spin the wheel and back their luck. Leander has a twist in some of their progressive pokies. In Africa Goes Wild the jackpot will hit before it reaches a specified value. In Scrooge’s Jackpot it will hit before a specified period. The most interesting jackpot pokies are the Gamomat titles with the Golden Nights features like Crystal Ball, Book of Crazy Chicken and King of the Jungle. With additional bets of different levels players can trigger a jackpot side game with every spin. The jackpot amount is more with the higher bets. In the side game three chests appear on the screen. If all three chests are filled with treasure then you continue to the Golden Nights draw. The collected points on the reels determine the jackpot win. Welcome Bonus: New players can claim the welcome offer when they make their first deposit. The offer consists of a 125% match bonus up to a maximum of AU$125 and 60 free spins. When you make the deposit, you will have to enter the given bonus code in the field. The bonus is non-redeemable. The wagering requirement for the welcome bonus is 40 times. The maximum payout from free spins is AU$250. A minimum deposit of AU$30 will be required to qualify for the promotion. Fruits4Real does not offer a VIP loyalty scheme at the moment. Offers for new players continue after the welcome bonus at Fruits4Real Casino. But the most attractive promotions are posted regularly in the News page. This is one place Australian players must visit a couple of time a week at least. The promotion codes are given in the casino client and are accessible only after players sign up. The basic offers are given below. Second Deposit Bonus - New players on their second deposit get a 50% bonus up to AU$125 and 20 free spins. Third Deposit Bonus - This is identical to the second deposit bonus. Ready Set Go Spins - On the first of every month Fruits4Real Casino offers 50 free spins to all players against a minimum deposit of only AU$20. Newsletter promotions - The Fresh Fruit Fest is a 35% bonus up to AU$200 on a deposit of AU$20 or more along with 50 free spins on a specified pokie. Super Spins are 50 free spins on a deposit of AU$20 or more. End of the Month offer is a 30% bonus up to AU$200 on a deposit of at least AU$20 and 30 free spins. These general promotion terms and conditions apply unless otherwise explicitly mentioned in the offer. All bonuses are non-redeemable. Only the winnings generated from playing with the bonus can be cashed out after the other conditions are completed. For deposit related bonuses the wagering requirement is always 40 times. No-deposit bonuses have a 50 times wagering requirement. Different games contribute differently towards the wagering requirement. The maximum payout from free spins or no-deposit bonuses is AU$250. Unless otherwise stated, a minimum deposit of AU$30 will be required to qualify for a promotion. Fruits4Real does not publish information on jackpot winners on their website. Customer support at Fruits4Real Casino begins with a comprehensive FAQ section. Common questions regarding Getting Started, Promotions, Financial and other aspects of the online casino operations are answered upfront. Australian players that still need clarifications can contact the customer support team through email or live chat. The emails can be sent directly from the support page using the online form. Live chat leads to real time free resolution of issues. Fruits4Real accepts deposits through credit cards from Visa and MasterCard, electronic wallets such as Neteller and Skrill, Internet Banking, Paysafecard and Bitcoin. Deposits can be made in AU$ and are processed instantly. The minimum deposit is AU$10 and the maximum deposit is AU$1.000. Withdrawals are currently available via Neteller, Skrill, Bitcoin and Bank Transfer. The maximum amount players can withdraw is AU$25,000. Withdrawal requests are kept pending for 24 hours during which they can be reversed. Then the processing takes another 24 hours. Fund transfer to Australian player accounts can take 3 to 5days. 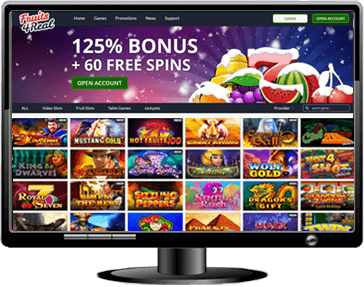 Fruits4Real Casino scores high because of its game selection from multiple software providers and continuous promotions through the News page. Particularly meaningful for Australian players is that transactions are carried out in AU$, so there is no loss on currency conversion. Also the selection of pokies is vast with themes that would be liked by Australian players. Access is available through all desktops and mobile devices. The one drawback is that live dealer games are not on offer yet.